Preston manager Simon Grayson has praised Jordan Hugill after the striker scored against his boyhood club in their League Cup loss to Middlesbrough. Hugill made his first start for North End after joining from Port Vale in June and netted his first goal for the League One club in the 3-1 defeat. The 22-year-old was a season ticket holder at Middlesbrough as a child. 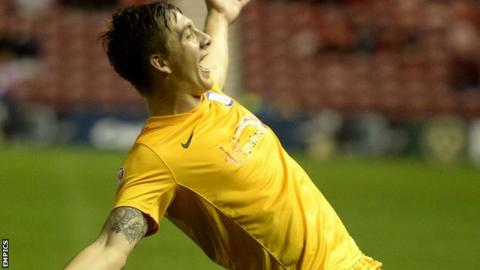 "It won't come any better than nights like this for him," manager Grayson told BBC Radio Lancashire. "He did really well at the weekend and earned the opportunity to play against the team he supports. "He worked really hard and got the rewards with the goal. He'll not forget this night for a long time."